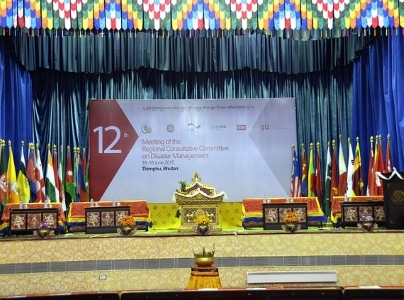 The Asian countries gathered at the 12th Meeting of the Regional Consultative Committee (RCC) on Disaster Management on 16–18 June in Thimphu, Bhutan. RCC member countries that participated in the meeting include Bangladesh, Bhutan, Cambodia, India, Indonesia, Lao PDR, Mongolia, Myanmar, Pakistan, Philippines, Sri Lanka, Thailand and Vietnam as well as development partners and international organizations. As part of cross-continental experience sharing and learning, government officials from Peru and Germany also participated and shared best practices on disaster risk reduction. The discussions revolved around the implementation of the actions outlined in the Sendai Framework for Disaster Risk Reduction (SFDRR) that was adopted by the international community at the 3rd UN World Conference on Disaster Risk Reduction in March in Japan. The global framework that succeeds the Hyogo Framework for Action of 2005–2015 highlights the importance of understanding disaster risk, strengthening disaster risk governance, increasing investments in disaster risk reduction, and enhancing disaster preparedness for effective response and ‘building back better’ in recovery, rehabilitation and reconstruction. The countries agreed that the RCC mechanism would focus on generating risk information to national governments and other stakeholders for risk-informed development planning, while also incorporating risk knowledge in education. The RCC mechanism will have a strong focus on increasing business resilience against disasters and protecting livelihoods and productive assets by safeguarding supply chains. Another priority area will be the development of multi-hazard forecasting and early warning systems for disasters. The member countries will also continue to develop strategies to manage disasters at the community level, and also ensure that gender perspectives, child protection, and the needs of vulnerable groups are fully integrated into the national disaster risk reduction action plans. “The RCC mechanism will assist the member countries in facilitating the technical mainstreaming of disaster risk reduction initiatives into development plans and policies in addition to implementing other key actions prioritized by countries during the 12th Meeting,” said Shane Wright, Executive Director at Asian Disaster Preparedness Center (ADPC) that is also the secretariat for the RCC. The three-day annual meeting was hosted by the Department of Disaster Management of the Ministry of Home and Cultural Affairs of Bhutan and ADPC, with support from the Government of Germany through GIZ.